Naturally lovely, this lovely plant garden is an inspired way to pay tribute at a wake, or to show family and friends your continuing support as time goes on. 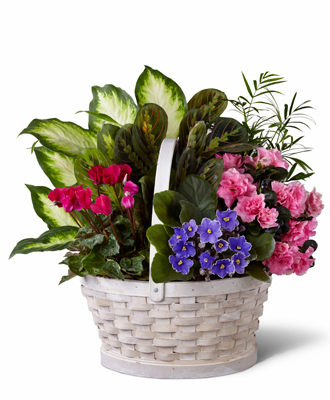 This colorful display of plants, assembled and arranged by a local artisan florist, includes a both blooming and green plants that thoughtfully delivers your sincere and sustainable expression of sympathy. Easy to care for, it?s sure to remind grieving family and friends that you were there for them when you needed support the most. It comes in a charmingly understated whitewashed basket that is appropriate for the home or office. Style of container may vary.